Rebound control has been a hot topic this year when it comes to Buffalo’s goaltenders. Robin Lehner has been at the forefront of these complaints as it seems many a fan are of the opinion that he’s incapable of controlling the pucks that strike him throughout the game. While it’s a fair assessment to say that Lehner has allowed more rebounds than Anders Nilsson, who has swallowed up most of the pucks fired in his direction, he’s hardly been costing the Sabres points with his play. As yet another goal was scored off a rebound against Minnesota, I thought I’d dive a little deeper into this argument. If you’re looking for a good breakdown on quality rebound control, InGoal Magazine has a nice breakdown of Louis Domingue that’s a nice read. You’ll notice that the two highlighted saves in that post feature rebounds coming off the goalie. They’re a way of life, especially when players are shooting to score. Thinking back through Lehner’s appearances this season I can think of a number of occasions this year where he’s done a poor job controlling pucks in his gut or around his hands. He’s shown, on occasion, a willingness to really attack pucks which can cause rebounds to kick out a bit further. However, looking back on the goals he’s allowed, I find very few instances of plays where there is a rebound created which Lehner could have done anything about. That is particularly true of the goal scored in Minnesota. Lehner is forced into an awkward save on a dead angle shot that creates the rebound which eventually winds up in the net. However, it’s a shot and save which can only result in a dangerous rebound. Not unlike the two goals scored in Edmonton on far par or far shoulder shots, this was similar, if not nearly identical. 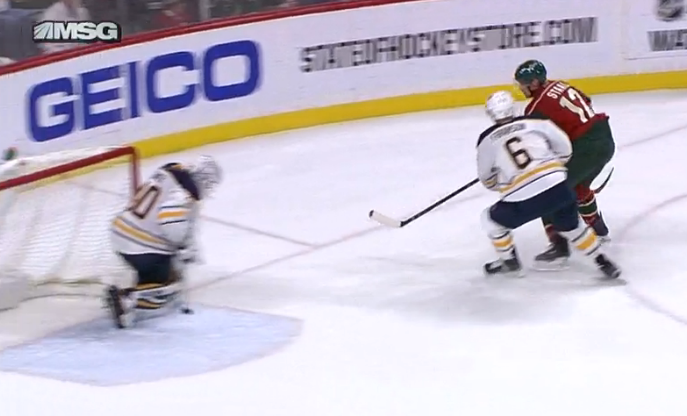 Minnesota’s zone entry on the powerplay was executed perfectly as Jason Pominville drew Jake McCabe prior to dishing to Eric Staal streaking through the slot. Cody Franson does enough to force Staal to his backhand and away from a prime scoring area. Lehner moves into a vertical-horizontal position to shut down any shortside opportunity Staal would have. The save is executed perfectly. Lehner seals the nearside post and any ice-level opportunity Staal would have. You’ll remember he was a little leaky on plays like this last year, most notably on Connor McDavid’s overtime winner in Buffalo. What’s key to keep in mind here is that another save selection leaves Lehner even more vulnerable than this one. Going RVH would expose the upper portion of the net shortside and leave far less leverage for a push across the crease on a pass or rebound. Standing his ground in a proper butterfly opens the door for getting caught on a wraparound (unlikely given Franson’s position) and still doesn’t eliminate the risk of a far pad shot, which Staal executes well here. The rebound goes to a dangerous area, as a far pad shot will do 90% of the time and it’s truly of no fault to the goaltender. Lehner uses the post and his anchor leg well to get across the crease to challenge the rebound. What he likely doesn’t account for is the amount of time Granlund has to choose if he’s shooting or deking. 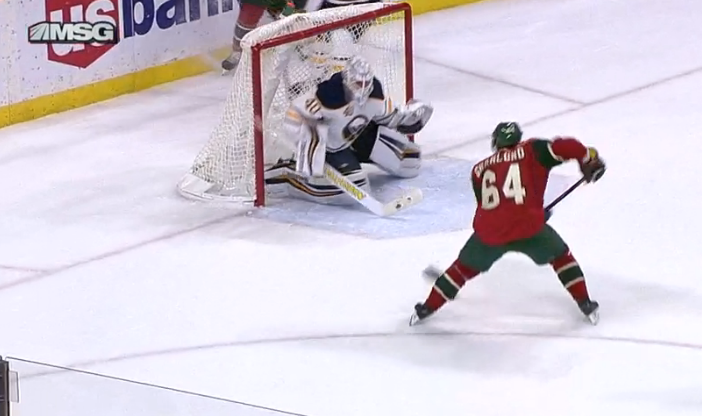 Lehner is hung out a bit as he’s come across the paint hard expecting an immediate shot. A stronger backcheck from one of Buffalo’s forwards would likely limit Granlund’s options, but in their absence he’s free to make a number of moves. His simple forehand-backhand deke goes hard against the grain and Lehner simply flies by. 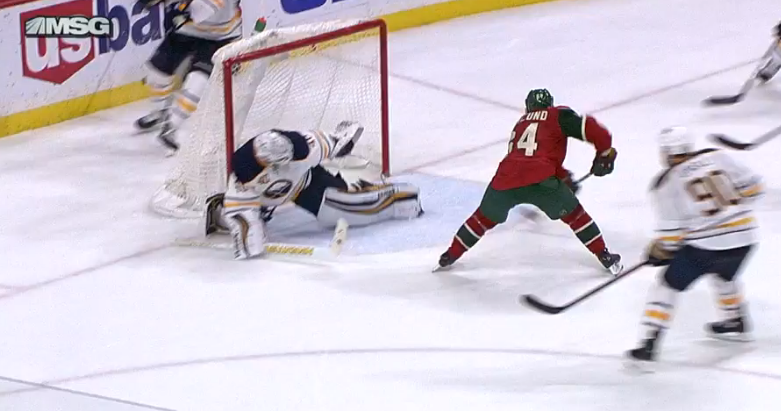 Lehner does appear to lose his balance as he’s stretching in desperation as Granlund cruises by. It’s not a great look, especially for anyone hoping to hop on his back for allowing a goal. In a perfect world he keeps his posture, re-anchors with his right foot and pushes back hard against the deke, making a terrific left pad save in the end. 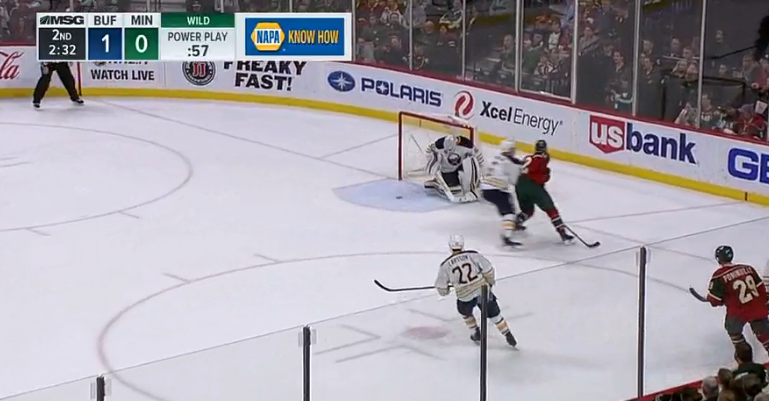 That’s an incredibly technical process to have play out and wouldn’t just require Lehner to have known Granlund would be streaking in from as high as he was, but that his lack of backside help would require at least one or two more saves, as opposed to simply facing down a contested rebound. 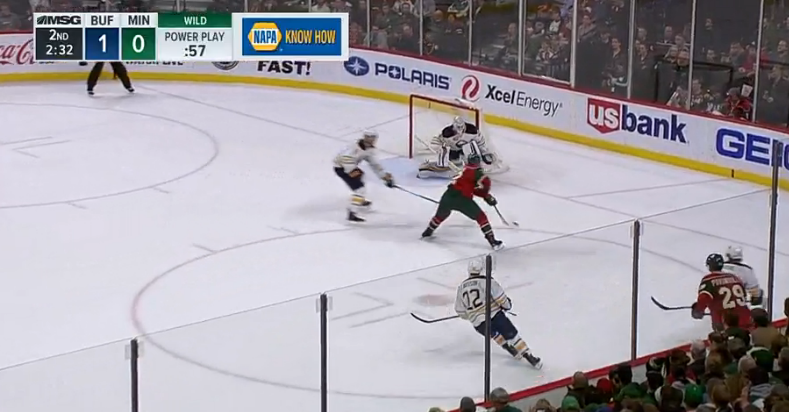 The only mistake Lehner makes on this play is being a little too aggressive as the puck rebounds into the slot. The shot that created the rebound will result in this nearly every time. Despite the goal being scored, Buffalo’s goaltender did a terrific job with the technical aspects of the play. He over-committed a bit later in the play but otherwise read and approached the play exactly how you’d expect him to. Lehner will be back in net against Toronto, a team whose speed and offensive ability will truly test him. If he manages to stand tall once again, the loss to Calgary may start looking like even more and more like an aberration as opposed to the standard.